Issue: A number of options in x737 is operated by the 'x737 menu' which is opened when clicking on certain parts of the overhead region. But where do you have to click? Solution: Click on the areas left or right of the overhead panel, marked out on the screenshot below. The menu is used to operate the doors and post a fuel request. and delete all files beginning with 'X-Plane'. Follow Xchecklist's installation manual and launch x737, the checklist will be loaded automatically. Thanks to Snailpup for the first checklist plugin, and thanks to Sparker for the great plugin Xchecklist. Solution: The yellow recangles on the 2D panel are part of the onscreen help, they indicate the mouse click regions. Every such region can be clicked to operate the x737project aircraft. The idea of visible mouse click regions is an X-Plane feature, and so you can turn it off in X-Plane if you don't need this help. and deselect 'show mouse click-regions in the cockpit' - that's it! Solution: x737 version 4. * does not have a 3D-cockpit! We are preparing for version 5 which has a perfect one. For more information about the development please see our x737blog. 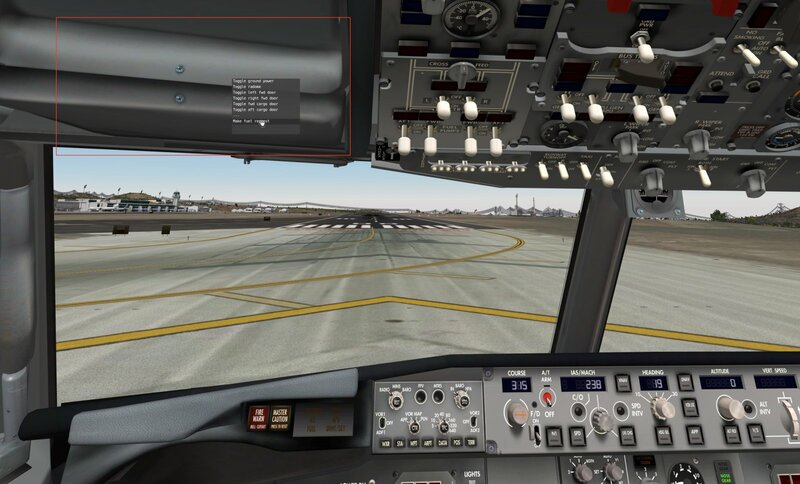 Reason: Starting with X-Plane 10.50 your favorite simulator adds green color to some clickable areas when 'Show mouse-click regions in cockpit' is selected. Solution: Turn off 'Show mouse-click regions in cockpit' in X-Plane, using the menu 'About->Instructions'. Note that this is not a bug, this is a feature! Solution: You can download more than 200 fine liveries for thebx737project aircraft. In order to load these liveries make sure that they are installed in the right hierarchy. Most problems occure because the liveries are installed one level to deep. Please refer to the image below to see how the structur. Example: Let’s say you want to use the livery ‚AeroMexico‘. Then you must place the folder ‚AeroMexico‘, which contains immediately the subfolders ‚conf‘ and ‚objects‘, inside the ‚liveries‘ folder. This is an X-Plane convention: In this case X-Plane expects the folders ‚liveries/AreoMexico/objects/‚ and x737 expects ‚liveries/AeroMexico/conf/‚. Select the right view in X-Plane! Solution: x737 version 4. * is equipped with a pretty good 2D panel! We are preparing for version 5 which has a perfect 3D cockpit. For more information about the development please see our x737blog. Look at the screenshot below to learn how to select the right defaults.